1. It can effectively prevent air leakage and high temperature water vapor from entering the cooler machine. 2. The pyramid shaped powder feeding device can make material particles largest extent accumulate in the cooling cylinder, avoid other vertical cooler’s shortage of single feed leading to the decrease of the cooling effect. 3. 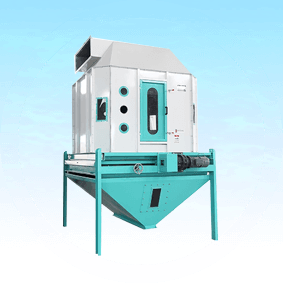 Due to the higher distance between air inlet and granular bed, so the suction condition can not be generated. 4. Air suction system, the direction of cooling wind is reasonable, the cooling tube is closed, the cooling tube is closed, the cold wind can only enter from the bottom, vertical through the material layer, so there is no “short circuit” and “channeling wind” phenomenon, fully improve the utilization rate of the cold wind, improve the cooling effect. 5. Due to use the unique and novel counter flow cooling principle, so that the high temperature granular materials to gradually cool, the material temperature is decreased, the water is fully distributed, and the cooling effect is remarkable, avoid the “shock cooling” phenomenon. 6. Adopt unique way to discharge material, rely on the reciprocating motion of the active frame change the relative position between itself and fixed frame, thereby forming the bottom of the whole cooler as line gap to discharge material uniformly. 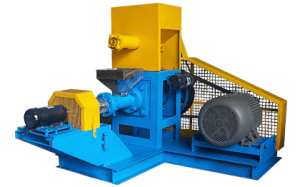 Counter-flow type cooler machine mainly made by rotary closed air feeder, air outlet, pyramid powder feeder, cooling box, up and down material level device, deceleration brake motor, an eccentric drive slide valve type discharging mechanism, fixed frame adjusting device, aggregate bin, body frame and air suction system. The working process is that the high temperature and humidity granular materials were uniformly spread out in cooling tank through air feeder and pyramid powder feeder, cold air get into the cooler and get heat exchange between the vertical material layer and the damp heat granule, then sucked out by air suction system, so that the particles can be cooled. 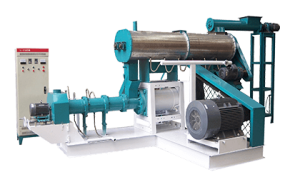 The cooling time is controlled by the position of the upper and the lower material level, the motor is switched on when the particle layer reaches the height of the material level, the motor stops when the particle layer is lower than the height of the material level. After motor stopping, the relative position between movable frame and fixed frame is controlled by the travel switch through the brake motor, this can ensure no leakage after stopping discharge. Slide valve type discharge mechanism is arranged at the bottom of the body box, deceleration brake motor make the movable frame for reciprocating motion by eccentric mechanism, change the relative position between the active frame and the fixed frame, to discharge the particulate material from the box, finally discharged by collecting hopper. 1.Regular check the tightening of various parts attachment bolt. 2.Observe all parts of the machine operation is normal. 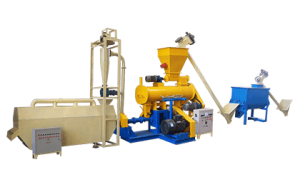 3.Empty all the material in the machine at the end of each day, so as to avoid the bonding phenomenon. 4.The rotation of the machine parts of the bearings should be regularly filled with lubricating oil. 5.The lubricating oil in reducer should according to the requirements fill and regular replacement. Please note: feeding in batch and discharging by manual.